Tangy Avocado Quinoa Salad is adapted from a very popular Turkish Bulgur Salad that is called Kisir. I used almost the same ingrediens. Bulgur is replaced by quinoa and chunks of avocado are added to the salad. A wonderfully tangy flavor makes the salad addictive. It has already become one of the family favorites! I’ll be making this salad often this summer because it is refreshing too thanks to cucumber and fresh mint in it. Trust me, it’s hard to stop once you start eating this salad. And after eating that much, it’s great to know that this is a healthy recipe. Quinoa has become one of my favorite foods since I discovered it last year when I made Feta Quinoa Zucchini Fritters. I’ve made several yummy dishes with quinoa since then. You can write ‘quinoa’ in the search box to see other quinoa recipes on the blog. I’ve used red and white versions so far and I find no flavor difference between them, just the color. I wish it was cheaper here. I’m sure I would use it in more dishes and everyone could try it then. It is still not a common product in Turkey, you can find it only in certain markets. Maybe that’s why it’s quite pricy here. The recipe for Tangy Avocado Quinoa Salad is super easy and you don’t need a lot of cooking for it. Just saute finely chopped onion, toss in quinoa and pour hot water over it. Let it simmer for 15-20 minutes or until quinoa is done. Then add all the other ingredients as soon as it cools down and stir altogether so that all flavors are combined well. I used the ingredients we normally use for Turkish bulgur salad excluding pepper paste and replacing bulgur with quinoa. 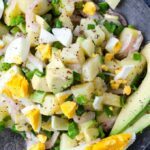 And I added one of my favorite foods, avocado to this tasty salad to make it even healthier. Quinoa is already a healthy food as it is high in protein and calcium, so I mostly prefer quinoa in our two-year-old son’s dishes. Avocado is high in healthy fats, so it’s a perfect addition. The crunchy and fresh flavor of cucumber pairs perfectly with tender and nutty avocado in this Tangy Avocado Quinoa Salad. I like to use it in salads. 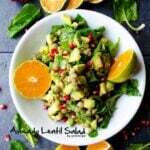 Have you seen our Avocado Lentil Salad? Tangy and healthy too. It’s one of our favorites! You can keep this Tangy Avocado Quinoa Salad in the fridge for up to 3 days, so you can just make it at the weekend and take to work during the week. It makes a wonderful picnic or potluck food too because you don’t need to heat it. Healthy and refreshing quinoa salad with avocado, cucumber, herbs and lemon. Heat olive oil in a large pan and saute finely chopped onion in it until golden. Toss in quinoa, salt and water. Cover the pan and simmer over the lowest heat for 15-20 minutes or until the quinoa absorbs all the water. Transfer into a large bowl and season with dried mint, cumin, black pepper and chili when it’s still warm. Stir well. Let it cool completely before adding the other ingredients. Add lemon juice and pomegranate molasses and stir. Taste at this step to see if it needs any more lemon juice. Toss in green onions, parsley, fresh mint, cucumber and avocado and stir just until everything is combined. Serve immediately or cover with a plastic wrap and store in the fridge up to 3 days.